I have mentioned time and time again, about the number of cancer patients and survivors I have met over the nearly 30 years since my diagnosis of Hodgkin’s Lymphoma. Each time I meet or speak with someone, it is entirely a different experience, and each time, leaving me with something else to consider that I had not given thought to before. I never got to meet the three other “kids” that were being treated for Hodgkin’s along with me. Unlike chemo suites today, I was kept secluded as were the others during our treatments. We never bumped into each other at follow ups. And other than my oncologist mentioning that I was the only one out of the four, I received the full complement of chemotherapy cocktail for the entire treatment plan, I knew nothing about them. To this day, I have no idea what ever happened to them. Were they still alive? Do they deal with late effects from the treatments like I do? Nothing. I have no idea. Facebook would come along and expand internet support even further for a rarely known and diagnosed cancer, Hodgkin’s Lymphoma. Soon, people were hearing about others getting together to meet up with each other to share their experiences. But as time went on, and our survivorship years increased, so did the issue of late effects. As most survivors of Hodgkin’s Lymphoma from decades ago will tell you, we were not studied to live beyond five years. Therefore, little if anything was known about late effects from either chemotherapy, radiation, or treatments of both. Many of us were simply told of a risk of a secondary cancer, and in my case, an enlarged heart. In my case, I would eventually and currently be diagnosed with over a dozen issues from cardiac, to pulmonary, to gastrointestinal, to spinal, muscular, and more. And yes, PTSD is another one of those effects. Once I became aware of my late issues, I then expanded the patients that I met with to include survivor issues, not just lymphoma. Not only am I meeting with others, but others are also making arrangements to meet other survivors and patients. Finally, word is getting known about the issues that we deal with because a well documented fact, unless you have breast, lung, or colon cancer, there is not much publicity or support for any of the “lesser” cancers. We have to do it all on our own is pretty much how we feel. And the truth is, we are making a difference. Perhaps not on a grand scale, but one at a time, survivors are finding out what is causing their bodies to betray them, seemingly without cause. We are now sharing where to find the medical help. And we are able to be the shoulder for someone to lean on when needed. This past weekend, I got to meet someone else from the world of Hodgkin’s, not a patient or survivor, but rather a family member. This happens quite a bit because they too want answers to what their family went through, in this case, her sister and nephew. You see, I was actually friends, though we never physically met, with her sister, the Hodgkin’s survivor. We had known each other several years, and actually lived near where I did in Pennsylvania, though oddly, we never ran into each other. Two years ago, she passed away, complications from the late effects that I mentioned earlier. 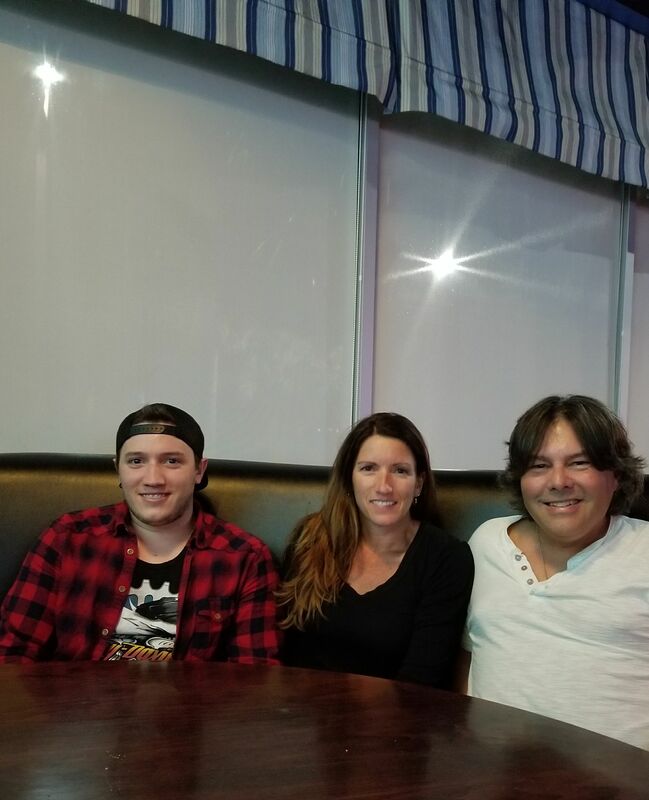 The sister and son live in Florida, same as I do, and we finally had the chance to meet. And like I said, everyone I meet or talk to, is always, and I mean always a different conversation about our experience, and we always come away affirming what we already knew, and learning something more that we had not considered. I asked questions about her late sister, about what she was like, how she dealt with her issues, and such. I mentioned that her sister was always the kind to help others, in spite of struggling with her own life. Here sister affirmed this is who her sister was. But if there is one thing that will stick with me from our meeting, and this has only happened with one other Hodgkin’s related friends, she not only got, but understood what the variety of late effect health issues that her sister struggled with, and gave unending empathy to her sister. And she is not the only sibling I know either, thanks to social media. This is really an understated issue among us Hodgkin’s survivors, getting not only friends, co-workers, but especially family members to realize how we look on the outside, does not reveal what our bodies are struggling with. It was so heartwarming to hear how she cared and tried to advocate for her sister. Even spouses often find themselves lacking in this common sense support even in spite of witnessing events of health flare-ups in person, refusing to accept the commitment of “for better or worse”, simply retreating to a world of denial (“it’s done, they’re better now, move on, they are fine”). No, we are not fine. And it was emotional for me to hear that from a stranger, how she felt for her sister. I know I am not alone in having to accept the level of denial or ignorance of the health issues that I deal with, regardless of what has been witnessed. But because of meeting Corrine and her son, and sharing our experiences, I know, without a shadow of a doubt, we survivors of Hodgkin’s our making a difference, a difference that medicine is now only just catching up to. Sadly, we will still have to deal with those who look at us and say “but you look great”. As words spread about us, so will the knowledge. And that is worth sharing.